The humble hamburger is a symbol of American cuisine. Who actually made the first hamburger in America continues to be debated, and numerous communities from Connecticut to Texas claim to be the birthplace of America’s beloved burger. However, it is widely accepted that the hamburger originated from Hamburg, Germany, where minced beef was combined with garlic, onions, salt, and pepper, formed into patties to make Hamburg steaks. These first Hamburg beef burgers were served minus the slices of bread or a bun. As German immigrants began arriving in the United States in the 19th century, the Hamburg steak was introduced on the menus at restaurants and was considered an expensive dish. It wasn’t until the Industrial Revolution that it became a dish that most people could afford to eat. Food cart vendors served the beef patties to factory workers, but they were difficult to eat while standing until a resourceful cook sandwiched the beef patty between two slices of bread, and the Hamburg sandwich was born. 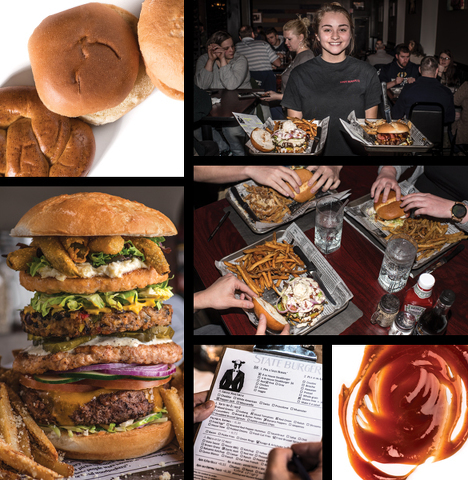 On a bun or between two slices of bread, a squeeze of ketchup and mustard, with cheese or no cheese, lettuce and tomato, maybe a fried egg on top, whichever way you like it, owners Sean Burke and Dustin Smith are letting diners build and name their own burger creations at State Burger Co., 101 South Allegheny Street in Bellefonte. Open Monday through Thursday 11 a.m.-8 p.m., Friday and Saturday 11 a.m.-9 p.m., and Sunday 11 a.m.- 3 p.m., State Burger Co. isn’t your fast-food, drive-thru burger joint; it’s a fun, casual dining restaurant where every burger is handmade, grilled-to-order, with a choice of cheese, 26 topping options, 21 sauces, and served on a selection of breads. Smith is a medical device quality manager by day. His family has owned a restaurant in Everett for the past 38 years. Burke is a Lewistown family physician who worked as a restaurant server when he was younger. “As foodies who both like traveling a lot, we decided to open a restaurant to blend those experiences we enjoyed across the country all under one roof. From the décor of the reclaimed wood, the corrugated metal, and steampunk fixtures to the variety of sauces and toppings, we want people to look over our options, customize a burger to their individual tastes while hanging out with friends and family,” says Smith. “All burgers are served with a side of fries with a variety of optional dustings such as garlic parm, Old Bay, Italian, and ranch, as well as dipping sauces you can add on,” Burke says. Since opening in December, State Burger Co. has quickly grown a loyal fan base. To satisfy every diner’s appetite, there are 8-ounce and 4-ounce burgers – steak, chicken, salmon, or veggie – on your choice of brioche, crostini, pretzel, Hawaiian, whole wheat, gluten-free, or you can make it a salad. The asiago-artichoke spread is a must-try on a burger! Some of the more unique sauces include garlic aioli, balsamic ketchup, queso blanco, peanut butter, house BBQ, and State sauce. A special menu of loaded fresh-cut fry platters like The Hangover is, as the name applies, what you crave the morning after, loaded with queso, cheddar, bacon, topped with an over-easy egg. “Our onion rings are made with red onions, so it’s sweeter and different than what people are used to,” says Smith. Other appetizers include the pickle fries and cheese curds. Malted milkshakes, such as the peanut butter cream pie, the grasshopper (chocolate mint), and cookies and cream, are a decadent treat to pair with the mouthwatering burger. Kids can also get in on the action at State Burger Co., by customizing their orders and writing letters to the kitchen staff. Look forward to new kid-approved offerings such as macaroni and cheese. Save some room for the peanut butter brownie dessert and coming soon, a signature dessert spoon made out of sugar cookies customizable to include chocolate mousse, ice cream, and sauce options. “At the end of meal, we give people gummy burger candy or cow tales caramel sticks. It’s fun for kids and adults alike,” says Smith. For more information, visit stateburgerco.com. FOR A SPECIAL OFFER FROM STATE BURGER CO., CLICK HERE.